My cat has this cauliflower looking spot on her back that gets puss. I don't think it's a wart, because it's not hard or dry, but it's starting to bug her, so I'm not sure what it is. I'm low on money, and hate to go to the vet if I don't need to. I will include a picture, but it does have betadine on it in the picture, which is the orangy look. Let me know what you think. I’m afraid that I can’t tell exactly what the mass on your cat’s skin is just by looking at your pictures. 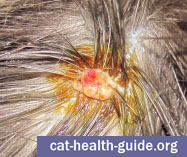 Your “cauliflower” description does make me think “cat skin wart” or a similar type of growth, but if it is bothering your cat, it should probably be removed no matter what it is. It looks pretty small, so it shouldn’t be too involved (or expensive) of a procedure to have the cat skin wart or growth removed. My Kitty has the EXACT same affliction, but only after I had her long hair cut down after adoption! She was full of matts, and I find it odd that they became so large after the hair cut!? I've been cleaning them 2 with Medicated First Aid spray w/anesthetic because the area is so sensitive. I hope she'll be ok, a trip to the vet at the moment would be very difficult. Thanks at least my baby isn't the only one afflicted with this. Don't forget about home remedies. If you can't afford a vet at tge moment I still want the cat to get treated. For warts applying vinigar every night should dry out the wart n go away .